In a recent analysis, "Was Barack Obama a Muslim?" I surveyed available evidence and found it suggests "Obama was born a Muslim to a non-practicing Muslim father and for some years had a reasonably Muslim upbringing under the auspices of his Indonesian step-father." In response, David Brock's organization, Media Matters for America (MMfA), which calls itself a "progressive research and information center dedicated to comprehensively monitoring, analyzing, and correcting conservative misinformation in the U.S. media," has criticized one of my sources of information. MMfA contends in "Daniel Pipes relied on disputed LA Times article to revive Obama-Muslim falsehood," that "key aspects" of a March 15, 2007, Los Angeles Times article I quoted were later challenged by another newspaper account, "Obama madrassa myth debunked," by Kim Barker in the Chicago Tribune on March 25. Falsehood? That's a strong word. Interviews with dozens of former classmates, teachers, neighbors and friends show that Obama was not a regular practicing Muslim when he was in Indonesia, despite being listed as a Muslim on the registration form for the Catholic school, Strada Asisia, where he attended 1st through 3rd grades. At the time, the school most likely registered children based on the religion of their fathers, said [Israella Pareira] Darmawan, Obama's former [1st-grade] teacher. Because Soetoro was a Muslim, Obama was listed as a Muslim, she said. The enrollment form from the Catholic school, which has been cited as evidence that Obama was a Muslim in Indonesia [including by the Los Angeles Times], also was rife with errors. It listed Obama as an Indonesian, listed his previous school incorrectly and failed to list his mother, Ann, at all. 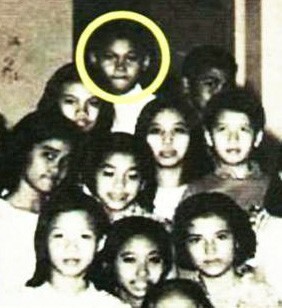 Barack Obama with his public school classmates in Indonesia. When Obama attended 4th grade in 1971, Muslim children spent two hours a week studying Islam, and Christian children spent those two hours learning about the Christian religion. Weekly religious classes are required for all students, whether Muslims, Christians or Hindus, under the government curriculum. A new shiny mosque is in the corner of the courtyard. "The Muslims learn about Islam, prayer and religious activity," said Hardi Priyono, the vice principal for curriculum. "And for the Christians, during the religious class, they also have a special room teaching Christianity. It's always been like that." In their first neighborhood, Obama occasionally followed his stepfather to the mosque for Friday prayers, a few neighbors said. But Soetoro usually was too busy working, first for the Indonesian army and later for a Western oil company. "Sometimes Lolo went to the mosque to pray, but he rarely socialized with people," said Fermina Katarina Sinaga, Obama's 3rd-grade teacher at the Catholic school, who lived near the family. "Rarely, Barry [a nickname for Barack] went to the mosque with Lolo." Barker learned from his friends and family that Lolo Soetoro, who died in 1987, was "much more of a free spirit than a devout Muslim" and "hardly the image of a pious Muslim." His nephew, Sonny Trisulo, 49, said Soetoro always liked women and alcohol. One of his health problems was a failing liver. "He loved drinking, was a smart and warm person, the naughtiest one in the family," Trisulo recalled. Zulfan Adi, a former neighborhood playmate of Obama's who has been cited in news reports as saying Obama regularly attended Friday prayers with Soetoro, told the Tribune he was not certain about that when pressed about his recollections. He only knew Obama for a few months, during 1970, when his family moved to the neighborhood. "Obama's 3rd-grade teacher at the Catholic school, who lived near the family [said that] 'Rarely, Barry went to the mosque with Lolo'" – confirming that Obama attended mosque services. All this matters, for if Obama once was a Muslim, he is now what Islamic law calls a murtadd (apostate), an ex-Muslim converted to another religion who must be executed. Were he elected president of the United States, this status, clearly, would have large potential implications for his relationship with the Muslim world. In sum: Obama was an irregularly practicing Muslim who rarely or occasionally prayed with his step-father in a mosque. This precisely substantiates my statement that he "for some years had a reasonably Muslim upbringing under the auspices of his Indonesian step-father." Therefore, what MMfA calls the "Obama-Muslim falsehood" is in fact confirmed by both articles as truthful and accurate. Calling this a falsehood is in itself a falsehood. Apr. 29, 2008 update: For a later analysis of this topic, streamlined and with more evidence, see "Barack Obama's Muslim Childhood."